Ancient Chinese secrets and wisdom are hard to resist. “Clouds follow dragons; winds follow tigers…all beings follow their own kind.” The I-Ching is an ancient oracle that offers an image of the present situation and future potential, and instructions on what to do or not do to obtain good fortune and avoid the bad. The content and order of the I-Ching is based on comprehensive observation of natural laws and cause and effect. The series of 64 hexagrams outlines the rise and ebb of interactions between Heaven and Earth, and provides a compendium of the greater recurring patterns of time and space. Wicked cool. The original I-Ching originated some 2,500 years ago and are based on the Fu Xi’s arrangement of the eight primary gua (or hexagrams) called the Earlier Heaven Sequence. This arrangement is also the basis for Chinese astrology and feng shui. Later King Wen arranged the 64 hexagrams, and his son the Duke of Zhou wrote the 386 Yao texts, brief summaries that include parables and metaphors. Confucius (circa 500 BC) added to this Sheng Ching (Holy Classic) with detailed commentaries. The first English translation was by James Legge (1882), followed by the well-known edition by Richard Wilhelm (1950). Many personalized extrapolations have been published since. Yet there has not been a completely new and fresh translation, and this is the point of this edition. Taoist Master Alfred Huang has produced a careful and complete rendering of this classic oracle by first translating the ancient Chinese into modern Chinese, and then into English. Huang was a secret disciple of Master Yin and learned the hidden lore of the I-Ching in the early 1960s. Condemned as an intellectual radical, Huang was imprisoned by the Chinese government. After 22 years of confinement, Master Huang was released in 1979 and immigrated to the US in 1980. He felt impelled to write a new translation and the first edition of this book was released in 1998. King Wen, too, was imprisoned by the tyrant of Shang, and spent this time studying the I-Ching and developing ideas about it. Master Huang includes historic references to King Wen’s personal history as it relates to particular metaphors and parables sprinkled throughout the text. The Ten Wings of Confucius are said to give the hexagrams flight, and are a necessary component neglected in other editions. Following Master Huang’s assessments, the first two hexagrams are a gateway or introduction and the final two the portals to exit. This leaves 60 hexagrams as the core of the I-Ching, numerically identical to full 60-year cycle of Chinese astrology. Huang’s translation emphasizes the tightly integrated and well-knit structure of the I-Ching – the hexagrams play out a full cycle of germination, growth, blooming and decay. The hexagram names have been adjusted to reflect the role of each in the cycle, a fresh feature that long-term fans of the I-Ching will find fascinating. The pages for each hexagram feature the image of the original jin wen or pictograph printed in red. There are new methods for consulting the oracle, two specifically designed to avoid the problem of multiple moving lines (like the Highlander, there can be only one). The translation preserves the poetic rhythms of the earliest manuscripts, thus yielding an oracular language filled with potentiality and auspiciousness. 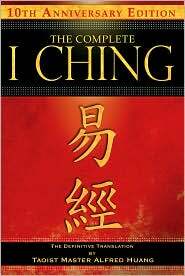 This is the definitive edition of the I-Ching, the best ever produced by every criteria. No previous edition of the I-Ching reflects this level of extremely careful and comprehensive scholarship, both about the oracle and about its originators. It is meticulously crafted by the author-translator, and his lengthy efforts reflect the highest respect for his subject. He succeeds in performing the neatest trick of the translator – becoming invisible. By doing so, he allows the reader to assert his or her own imagination in gaining personal wisdom and meaning for each hexagram at the time it is cast. The book is beautifully formatted and designed to be quite readable and easily accessible during divination. The retail price is very low for such a lengthy, high-quality text. This book is an absolute requirement for those who rely upon the I-Ching, and most highly recommended as a primary text for anyone wishing to learn how to use it. Highest commendations to author and publisher – excellent!